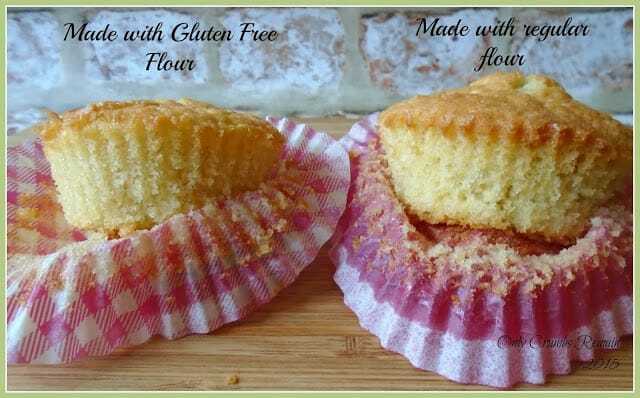 A side-by-side baking experiment in which I compared the taste and bake of gluten free flour against regular flour in cupcakes. 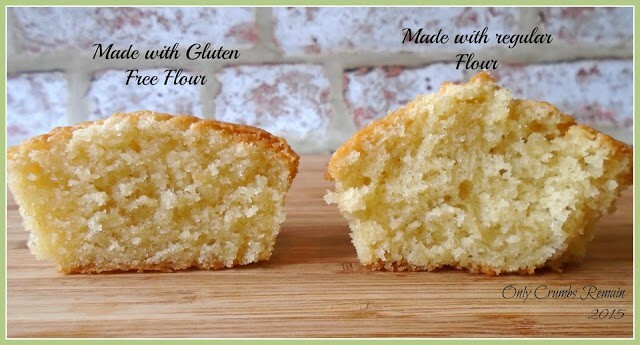 What a difference your choice of flour makes to a bake! After all of the time consuming GBBO bakes, I decided the other day to make something delicious and simple. 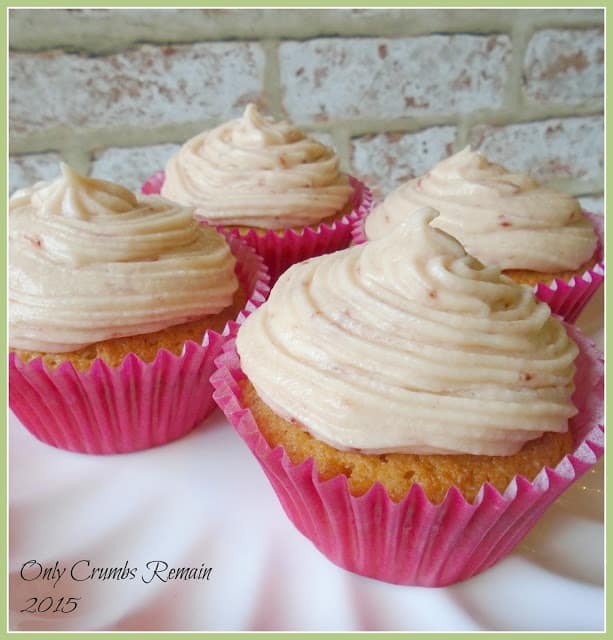 What’s more simple than a regular cupcake. Nothing fancy, just a straight forward Victoria sponge topped with a cream cheese frosting. Delicious! However, having an unopened bag of gluten free flour in the cupboard, I decided to undertake a little experiment! My old school science teacher will be chuckling to himself now! Angela doing an experiment! I’m the first to admit that I’m not scientifically minded. At secondary school during an end of year science test, our slightly eccentric teacher left the lab allowing us science ‘thickies’ to get our books out from our bags! (Tut-tut!) Even after that cheating, I still didn’t managed to get 60%! Needless to say, I didn’t choose physics or chemistry in my options! Now, Mr E understands science, he’ll often try to help me understand the warping of space time (what!) and will explain quantum mechanics to me, for instance! My head hurts just thinking about it. Yet, the more I read about baking, the more I realise it’s quite a science in itself. From getting the ratios correct to the oven temperature. I guess it wasn’t called ‘Domestic Science’ for no reason. So what was my experiment? 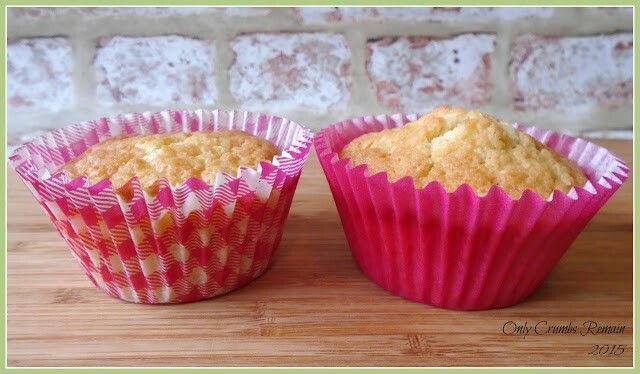 Well, having learnt a little about gluten free flour during the GBBO ‘Free From’ week I decided to have a play conduct an experiment to see if there is any difference in the look and eat of a Victoria cupcake made with gluten free flour in comparison to a regular flour. Gluten, as we know, is the protein in flour and different flours contain different levels of gluten. When we make bread, for instance, we use a ‘Bread Flour’ which has a higher gluten content because it is this which creates the structure of the loaf once it has been kneaded. When we make a sponge, we use a flour with a slightly lower gluten content such as Self Raising Flour or a Plain Flour with an additional raising agent and fold it gently into the batter. During a little reading I did during the GBBO Free From week, I realised that the gluten in the flour could make sponges tough and heavy if it was over worked when folded into the beaten batter. I made a regular batch of Victoria Sponge in my usual way. I creamed the butter and sugar together, and then added the eggs gradually. At this point I divided the mixture into two bowls (it was weighed to ensure they were both identical). I then folded plain flour with baking powder into one bowl and into the other bowl I folded in the gluten free flour with gluten free baking powder. So the only difference between the two batches was the flour. I then weighed the mixture into cupcake cases (a different design for each variety), to ensure consistency throughout. The cakes were then baked for the same time duration, being rotated in the oven two-thirds of the way through. And the result? To start with, the gluten free flour seemed a little finer when I weighed it out. The batter made with this flour tasted slightly ‘odd’ on my pallet when I licked the bowl out (admit it, we all do it), most probably because the flour is made with grains I don’t usually use. I wasn’t overly surprised by these two points, but I was surprised by the fact that there was a marked difference in the rise of the two batters. 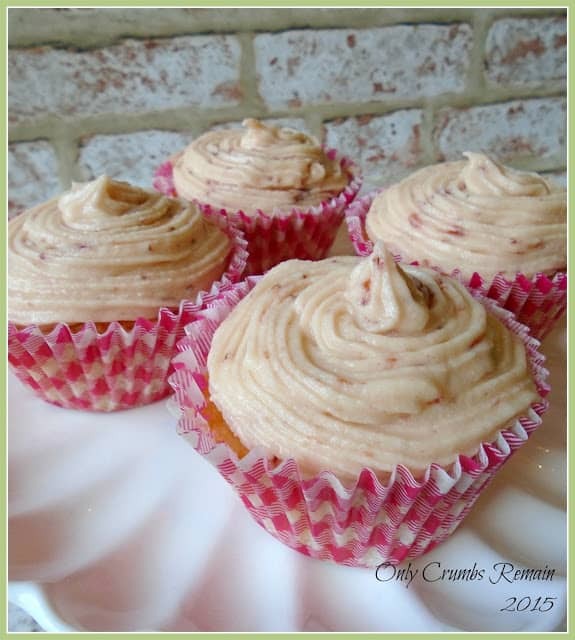 As you can tell from the images, the cupcakes made from the gluten free flour rose far less than those made with the regular flour; they were flatter where as the others were domed. 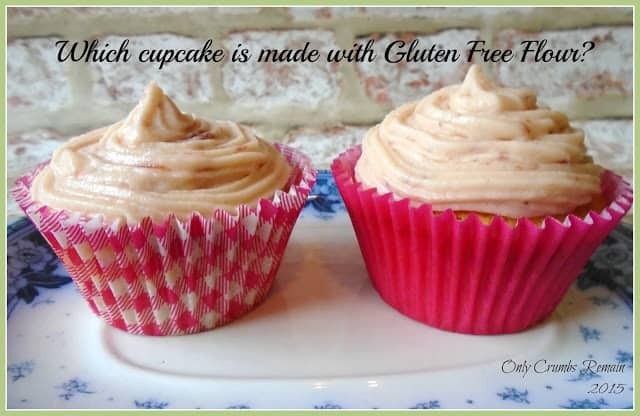 The flatter gluten free cupcakes though, made it far easier to attempt to pipe an icing on. The upper crust of the cakes also differed. Those made from the gluten free flour was soft compared to a crispier top of their counterpart. And the eat? Five people, other than myself, ‘volunteered’ their services in testing the cupcakes. Only I knew which cupcake was which, so my taste testers sampled them blind, so to speak. Three of the five preferred the gluten free cupcake, stating that it was simply a better sponge. Our retired chef neighbour even thought it was a Genoise sponge rather than Victoria as it tasted so much lighter. My other two tasters preferred the cakes made with the usual flour, one stating that they tasted ‘normal’. As for myself, well I too preferred the gluten free sponge, though looking at them following the bake I was anticipating my verdict to be the other way around. There wasn’t a vast difference between the two, but it was noticeable. And although I picked out an ‘odd’ taste in the raw batter I couldn’t taste that after the bake. I found the ‘crumb’ to be finer too and in general an all round better eat. So of six cupcake tasters (including myself), four preferred those made with the gluten free flour. Ok, so it wasn’t a massive experiment. I only had a handful of tasters and the results weren’t a white wash in favour of one specific flour, however it was very interesting how the two flours worked in the same batter. I shall certainly use the gluten free flour again, (though not all of the time as it is a little more expensive) quite possibly in my Mum’s forthcoming birthday cake, especially as she was one of those who preferred the that version. 1. Pre-heat the oven to 190c / Fan 170c / Gas 5. Place the muffin cases into the muffin tray. 2. Make the sponge. Place the softened butter and sugar into a good sized bowl and beat together with a wooden spoon or electric beaters until pale and fluffy. Gradually add the beaten egg a little at a time, beating well after each addition. Sieve the flour and baking powder into the mixture. Using a spatula or large metal spoon fold this in gently. If the batter seems a little dry, add a some milk and gently mix to combine. 3. Fill the muffin cases. Using a teaspoon, fill the cases with the batter mixture. You’re aiming for them to be half to two-thirds full. 4. Bake. Place the muffin tray in the centre of the oven and bake for about 20 minutes. You may need to rotate the tray after 15 minutes of baking. Once baked, remove from the oven and place on a cooling tray. 5. Make the frosting. Place the butter into a good sized bowl and beat with a wooden spoon or hand held electric beaters to ensure it is nice and soft. Sieve the icing sugar into the butter. Mix this into the butter (I’d recommend doing this slowly with a spoon to start with to prevent an icing sugar dust cloud forming!) Once incorporated, use a beater to thoroughly mix for about a minute. Add the chilled cream cheese and beat together well for a further 2-3 minutes, though do avoid over beating as it can become too soft. Place the jam in a small bowl and stir it around to soften it. Add the jam to the frosting and mix together. If the frosting has become too soft, place the mixture into the fridge to firm up. 6. Decorate the cupcakes. Either fill the icing bag (fitted with a nozzle if desired) with the frosting and pipe over the top of the cupcakes. OR, use a dessert spoon to place a quantity of the frosting onto the top of the bun and smooth it out with the back of the spoon. 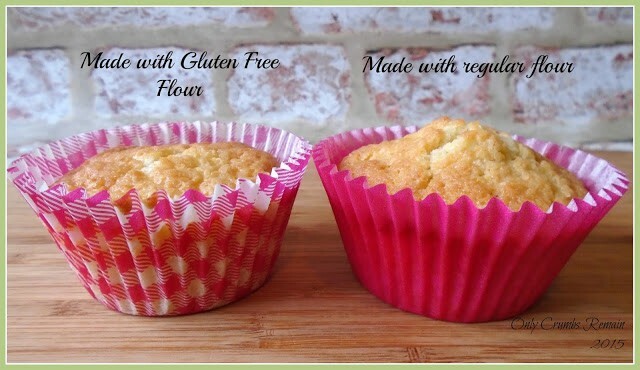 I have always wondered about what a difference gluten free flour would actually make. I don't have anyone with gluten issues in the house **knocks on wood** therefore I still use regular flour. Thanks so much for sharing your "experiment" with #foodpornthursdays. It's fascinating the different effect it has on our baked goods. Our household and extended family (thankfully) aren't gluten intolerant but I shall certainly use it again in future bakes because of the lightness it created in the eat. This is really fascinating Angela. Looking at the cakes I thought the regular flour would win easily as it's risen so much better so I was surprised at the comments about the gluten-free sponge. I've got some gluten free flour in the cupboard so I'll have to give this a try sometime. I totally agree, it really is surprising and interesting. I too expected the cupcake made with the regular flour to have tasted lighter but a blind taste test certainly tells the truth. I was also surprised by the difference in the amount the two batches rose. Ooh, yes, do give them a go I'd love to see if your results come out the same. Do send me a picture. This is so interesting. I never had gluten free cakes, only some bread that I didn't like at all. I guessed correctly which one was the gluten free one (I'm so proud of myself!). I think I will try your experiment. Ooh do give it a go Anca, would love to see if you get the same outcome as myself. You'll have to send me a pic. I've tried gluten free flour only twice previous (also in bread) – the loaf was awful but the pita bread were acceptable. Thanks Madeline. To be honest, I wasn't expecting that much of a difference in the look of them but I had a hunch that they would (or should in theory) be lighter with the gluten free flour. I too found it really interesting. It's nice to start to understand why we do specific things in baking. In the catering trade, baking is seen as a profession in itself. I remember working in hotels and restaurants when I first left college, and the pastry chefs would be tucked away in the corner of the kitchen, sometimes with their own room, producing the best smells you could ever imagine. Those that bake will know you have to measure EVERYTHING. Those that cook, will add a bit of this and a bit of that, turn up the heat or turn it down. It's only since I've had the boys that I've been baking as much as I've been cooking, and I have to say, it's not good for the waistline! I was so lucky as a child to have had great baking mentors in my Grandma and Mum. Ok, they didn't necessarily know the reason and science behind what they were doing but they always baked well. As you say, measuring everything precisely. We used to bake with a dial faced kitchen scale and it used to drive me bonkers as I would often have to reset the needle which always made me wonder how accurate the measurements were. My parents then very kindly bought me some electronic scales which measure in grams and ounces but also weighs liquid. They've been brilliant. They're used every single day and they're so accurate as I can weigh single grams rather than an approximate ounce (c 25g) on the old scales. You're right Lauren, it's so precise and adding different things in different ways to a mixture can have totally different effects. Cause and effect, gosh that takes me back! This was a fascinating read Angela! Thanks for sharing this with #CookBlogShare. I was also rubbish at science at school, though I think I'd find it quite interesting if I were to study it again now. It's a wee bit embarrassing but a long time ago now! Thankfully no more science tests / exams for me now! Yeah, the results were interesting. To be honest, I expected the gluten free one to rise more than it did but the texture was far nicer. But you're right, they both tasted pretty darn good! Baking is a science and you have done well with this one to figure out what works. Thank you Malinda. My mind always seemed to close off as soon as people mention the word 'science'. But you're right baking is a science – a very enjoyable delicious one!